Aaron was born in Monticello, UT. He was the seventh of eight children born to Randy and Laura Butler. He has one sister – Shannon – whom he adores, and six brothers – Shane, Quinn, Nathan, Andy, Chad and Adam – who have been his companions through life. From the beginning, Aaron has been a very determined, adventurous soul. As a young child, his bright blue eyes were always looking for mischief, which he usually found. He was so full of life, happiness and endless energy! He loved the outdoor adventures best and could usually be found with a stick or a critter in his hands! He participated in and enjoyed the Boy Scouts of America, eventually earning the rank of Eagle Scout. Throughout high school he excelled in music, football and his main focus, wrestling. He set a specific goal to become a four-time state wrestling champion. Through hard work and extraordinary determination, he realized his goal, becoming the first ever in Monticello High School history to achieve this mark and just the 17th wrestler in Utah State history. In 2009, Aaron volunteered himself for full-time service as a missionary of The Church of Jesus Christ of Latter-day Saints. He was called to labor in the Ghana Cape Coast Mission in Africa. For two years, he worked tirelessly, teaching the gospel of Jesus Christ to the Ghanaian people. He served them with a great love and compassion. He aided them in building and improving homes, wells and made numerous additional efforts in their behalf. His dedicated service to others in this way highlights a distinct trait in his personality and soul. He cared about his fellowman, their safety and wellbeing. He served others with the love of Jesus Christ. From a very young age, Aaron became interested in the United States Military. As a first grader, he announced to his family that he would be a soldier when he grew up. From that time on he never once wavered in that resolve. On April 10, 2008, while still in high school, he enlisted in the Utah Army National Guard, where he laid the building blocks of his military career. In 2014, he began the grueling Special Forces Training program. 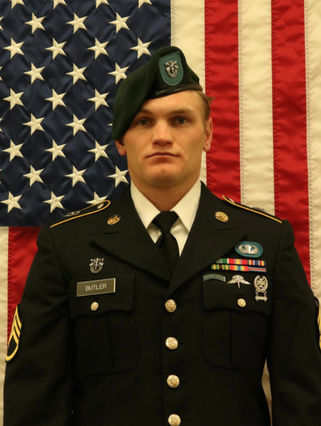 On January 14, 2016 he graduated Special Forces Training and donned the Green Beret. He is one of four soldiers to graduate with honors. Since that day, he has been decorated with additional combat awards. Aaron died on August 16, 2017 at the age of 27 in Nangarhar Province, Afghanistan, of injuries suffered from an improvised explosive device while clearing a booby-trapped building. Aaron was a natural-born leader. He was determined to become an elite soldier and always led from the front. He wanted to be the ‘tip of the spear’. He led by example and swift action. He personified the Army’s values in everything he said and did. He was a strength and inspiration to all those around him and a joy to his family. Aaron was absolutely fearless, selfless, courageous and relentless. In a life that was all too brief, our dear son and brother made the ultimate sacrifice for his country. Aaron is survived by his parents Randy and Laura Butler of Monticello; fiancé Alexandra Seagrove of Cedar Hills, UT; siblings Shannon (Brad) Young of St. George, UT, Shane (Michelle) of American Fork, UT, Quinn (Leesa) of Pleasant Grove, UT, Nathan (Brooke) of Bluffdale, UT, Andy (Tori) of Saratoga Springs, UT, Chad (Kelly) of Bluffdale, UT and Adam Butler of Heber City, UT; grandparents Pat and Marva Butler of Monticello and Stan (Diane) Augustine of Kettle Falls, WA; and 23 nieces and nephews.